We rent only eco-friendly pumps from Hygeia. 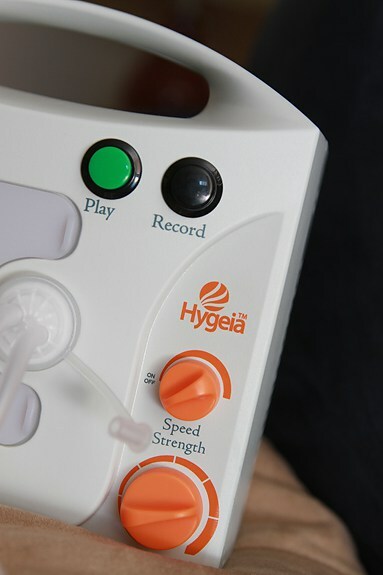 Hygeia is the only breast pump company endorsed by La Leche League International and one of the very few WHO Code compliant pump companies. That means that they support the World Health Organization’s International Code of Marketing of Breast-milk Substitutes. Simply, they believe that breast milk is the normal way to feed human babies and choose to market their products without undermining breastfeeding in any way. Designed for long-term and frequent pumping when battery pumping is required, the EnJoye™ (with internal battery) is a hospital-grade performance, personal-use, double electric breast pump (with internal battery) for single or double pumping. Mimics your baby’s unique suckling patterns with customizable speed and pressure controls. All pump parts that come into contact with breast milk are BPA/DEHP free. Breast pump accessory kits are not included in the price of the rental and are necessary to use with the breast pump. We offer Enjoye™accessory kits at a cost of $49.95 if you need one. Breast Pump rentals are prepaid and you are committed to that rate for the full term of that option. There is a one month minimum on all rentals. A refundable $20 credit card deposit and a credit card number are required for all breast pump rentals. All breast pump rentals are subject to local taxes. The longer you rent, the more economical it becomes. Is a rental pump right for me? In addition to rental pumps, we also carry a full line of Hygeia single user breastpumps, breastpump accessories, and replacement parts. In some cases pumps may be delivered during the course of an in-home consultation, however pumps must be returned to our offices. If you are visiting Miami from out of town, we may deliver to your hotel for an additional charge. Will my insurance company reimburse me for the rental of a breast pump? If you are pumping because your infant is premature or ill or for some other reason you are unable to nurse, your insurance company may reimburse you for the rental of the breast pump. As a result of the Affordable Care Act Health plans are now required reimburse for the purchase of breast pumps or provide you with a pump. To learn if your insurance carrier has a DMEreimbursment policy call the 1-800 number on the back of your subscriber card. What happens if I my pump stops working? We will gladly switch your pump out as long as the problem is with the motor. What if something happens to the pump while I am renting it? All repair costs and replacement fees are the responsibility of the person who signed the contract.